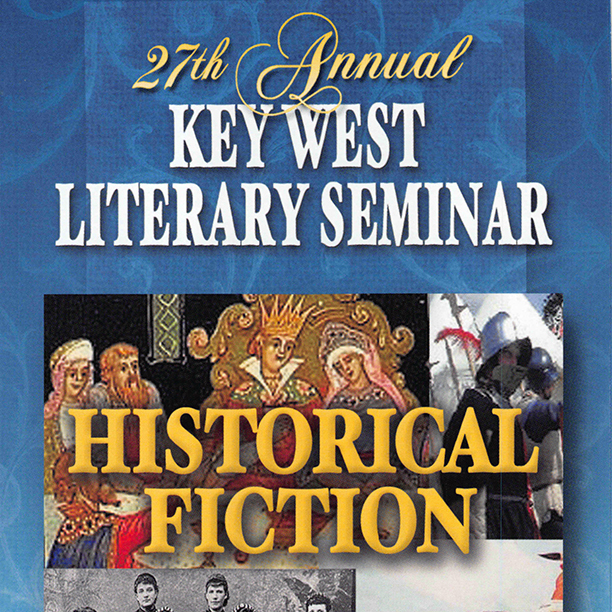 Coverage of the 2009 Seminar: "Historical Fiction and the Search for Truth"
Presenters: Chantel Acevedo, Calvin Baker, Russell Banks, Andrea Barrett, Madison Smartt Bell, Geraldine Brooks, Alan Cheuse, Peter Ho Davies, Eric Foner, Elizabeth Gaffney, Francisco Goldman, Allan Gurganus, Ursula Hegi, Samantha Hunt, Jane Kamensky, William Kennedy, Rachel Kushner, Jill Lepore, David Levering Lewis, Thomas Mallon, Megan Marshall, Valerie Martin, Peter Matthiessen, Ivy Meeropol, Michael Meeropol, Anchee Min, Mary Morris, David Nasaw, Sena Jeter Naslund, Patricia O’Toole, Joyce Carol Oates, Marilynne Robinson, John Burnham Schwartz, Barry Unsworth, Gore Vidal, Hilma Wolitzer, and John Wray. Writers’ Workshop Faculty: Alan Cheuse, Billy Collins, Edward Hower, Alison Lurie, Mary Morris, Bich Minh Nguyen, Patricia O’Toole, Porter Shreve, Dara Wier, and Hilma Wolitzer. The stage setup for the 27th Annual KWLS. Photo by Curt Richter. "Historians and Novelists: What's Your Take?" with Barry Unsworth, Peter Ho Davies, Sena Jeter Naslund, Megan Marshall, moderator Michael Meeropol and Patricia O'Toole. Photo by Curt Richter. The crowd at the 27th Annual KWLS. Photo by Curt Richter. KWLS Executive Director Miles Frieden. Photo by Curt Richter. Photographer Curt Richter signing his book, "A Portrait of Southern Writers". Pulitzer Prize winning novelist William Kennedy reading from "Roscoe" during "Imagining a real-life place called Albany". Photo by Curt Richter. Novelist Geraldine Brooks during her reading from "March". Photo by Nick Vagnoni. A coffee break during the 27th Annual KWLS. Photo by Curt Richter. "Who Owns History? : Rethinking and Re-Imagining the Past in a Changing World" with Eric Foner. Photo by Nick Vagnoni. "Writer Against the Grain: An Interview and Conversation with Gore Vidal" moderated by Jay Parini. Gore Vidal interviewed by Jay Parini during the panel, "Writer Against the Grain". "Literature as a Point of Departure" with authors Sena Jeter Naslund and Geraldine Brooks. Photo by Nick Vagnoni. Former Poet Laureate Billy Collins during a reading at The Studios. Photo by Curt Richter. Novelists Calvin Baker and Andrea Barrett during a reception. Photo by Curt Richter. "Taking Liberty-Fiction and the Archives" with authors Jill Lepore and Jane Kamensky. Photo by Nick Vagnoni. Authors Elizabeth Gaffney and Calvin Baker. Author Marilynne Robinson reads from "Gilead". Photo by Nick Vagnoni. Author Thomas Mallon reads from "Fellow Travelers". Photo by Nick Vagnoni. Author Anchee Min with daughter Lauryann Jiang during the panel, "Empress Orchid and Women of Red Detachment". Photo by Nick Vagnoni. The daughter of author Anchee Min, Lauryann Jiang, during her mother's panel. Author Madison Smartt Bell during his panel, "The Relation of Fiction to Fact in Historical Fiction". Photo by Nick Vagnoni. Author Samantha Hunt during her panel, "Nikola Tesla and the Invention of Everything Else". Photo by Nick Vagnoni. Authors Andrea Barrett and Samantha Hunt during their panel, "Science and History". Photo by Nick Vagnoni. Author Andrea Barrett reads from "Ship Fever". Photo by Nick Vagnoni. Author Chantel Acevedo reads from "Love and Ghost Letters". Photo by Nick Vagnoni. Authors Rachel Kushner and Chantel Acevedo during their panel, "Recreating Cuba's Past". Photo by Nick Vagnoni. Author Rachel Kushner reads from "Telex from Cuba". Photo by Nick Vagnoni. The panel, "Our Place in Historical Fiction" with William Kennedy, Russell Banks and Joyce Carol Oates. Photo by Nick Vagnoni. Author Russell Banks reads from "Cloudsplitter". Photo by Nick Vagnoni. Author Francisco Goldman reads from "José Martí: The Divine Husband". Photo by Nick Vagnoni. Novelist Joyce Carol Oates during her reading, "Wild Nights!". Photo by Nick Vagnoni. Novelist Gore Vidal during a reception. Photo by Nick Vagnoni. Pulitzer Prize winning novelist William Kennedy at a reception. Photo by Curt Richter. David Wolkowsky at a reception. Photo by Curt Richter. Novelist Madison Smartt Bell with KWLS Executive Director Miles Frieden. Photo by Curt Richter. KWLS Executive Director Miles Frieden, KWLS board president Lynn Kaufelt and KWLS board member and author Judy Blume. Photo by Curt Richter. Eric Foner: 2009: Who Owns History? Barry Unsworth: Why Bother with the Past? How Can We Know (and Tell) What Happened in the Past? Historians and Novelists: What’s Your Take? Historical Fiction: Noun or Adjective?